Wherever You Are: Letting go...now? Life had been pretty hectic the past couple of weeks - what with Ayah's Larian Kardio, Hanna's UPSR exam and organizing Hilman's 7th birthday party which went very well indeed last Sunday 9th September - which also marked our 13th Wedding Anniversary. Hanna is a very sanguine, happy-go-lucky child, and she is very independent. But, of course, being an 11-year old, most of the times she behaves like an 11-year old - which sometimes get on my nerves because looking at her, physically I expect her to behave like a 16-year old! Yes, I have to admit - sometimes I do forget her actual age... Only when she is with her girl friends from school, giggling and gossipping away, and pulling and tugging at each other like small kids, I remember that she's only 11. The first time experience of having a child taking the government UPSR exam last week was something else. Hanna being Hanna, was so relaxed about the whole thing. She seemed prepared - the "Hanna Way". She is not the type who studies 5-8 hours a day. For her, 1 hour is enough and on the days that she has her 1 1/2 hour tuition sessions at home, the max she could go would probably be 2 1/2 hours. And when she does her revision - she would also be listening to the i-Pod, etc. It seemed to have worked for her and she had been getting good results for all her exams all these while, and I did not want to change her style of studying in the last 2-3 weeks before the exam... But, I have to admit that I had a very strong urge to ask her to do away with the i-Pod and to make her study 4-5 hours a day in the 3 weeks running to her UPSR. 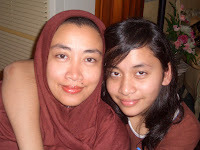 But, I finally decided against it when I thought that it would better for her to maintain her studying pattern, and not disrupt her studying rhythm (and I pray to Allah swt that I was doing the right thing!). I know that I should start letting her go bit by bit from now on, especially when I know that, if given the rezqi, insya Allah, she might get the chance to go to a boarding school next year. Knowing Hanna, I know she will be okay, and insya Allah she will do well with her "Hanna Way" in a boarding school. But, the real question now is - will I be okay with her not being at home with me? Can't agree with you more, dear. Looking at Hanna now and thinking how she was 10-11 years ago. Our lives actually completely changed when we got Hanna, as everything...absolutely everything revolved around her. No more movies..hanging out with friends..late night coffee, and so on. And if I may say so...she was so cute then! Hanna, you were so.. so...err..pink and fair!Hehehe... Yes, Hanna..you were so cute (don't know what has happened to you since!). And now she's 11+...and turning 18 soon! At times she's just a normal 11+ yo kid but at other times she makes us feel that we have a grown-up daughter..no more the little angel! Hmmm...imagine if you have an 11+ yo daughter who is taller than your wife and has 2 feet which are longer than yours!!! I wear size 8 shoes, btw. Will tell her about the A&W thingy.Just make sure you guys come back home soon! At least U allow Hanna to go on school's outings. Anak I si Farah yg dah Form 1 tu, my hubby still say "No" to all outings. I know...writing this entry brings back a lot of memories of us being first time mom and dad nearly 12 years ago. We were so rigid and did everything by the book! Even her mealtimes had to be on the dot - not a minute more, not a minute less. And I still remember insisting that she finish the whole 8oz of milk because the instruction on the tin stated that for 8 month- old babies, it should be 8oz every 4 hours or so! And I would change her diapers every 2 hours when they were not even soiled! But, when we had Hasya and Hilman -we sometimes forgot that it was time for their milk...and diaper-changing depends on how heavy their diapers had become after a few "small businesses"! Hahaha! But, all three turn out okay what?!!! I understand that you may be a little 'overprotective' towards hanna, she is your daughter after all. And an eager, young girl. At least i am when i was her age. Tapikan, consider hanna lucky, her parents gives permision to go out with friends. I myself, never had that privilage until after my PMR. Itupun berhantar berjemput. That was my first AND last time, until after my SPM. Even now, my dad still think im too young. But i think he's learning to let go, letting me be a little independent. Parents will always be parents. You just have to live with dad. oh... i know the feeling. Hanna is a lucky gal, she is! anyway, wishing you, ayah and everyone in you family and happy and blessed Ramadhan! allah grammar and vocab huru-hara! Sist! Firstly, you two look like sisters! (compliment for you..hehehe) Come on, mama dia kan was from STF, and turn out to be excellent. She will be too. She's one lucky kid. All the best to her! I guess every parent has his/her own way of dealing with the empty nest syndrom. Some can let go of their children and let them be independent early in life, while some may never be able to "cut off the umbilical chord" even when their children have families of their own. Whatever it is, it shows that we parents love our kids very, very much. I am pretty strict with Hanna (as is her Ayah, too), but at the same time I try to be her friend, hoping that I will be the first person she will come to when she's feeling down about anything at all. Sometimes we don't know if we're doing the right thing for our children kan, K.Ena? Take care, K.Ena... and Selamat Berpuasa to you and family, too. Thank you...but, errr...I don't think Hanna appreciates it if people say we look like sisters! Hahaha! GAHH, Ayah is so sentimental! U N ME DO NOT LOOK LIKE SISTERS! I feel so old -_-"
Well, I dunno what else to say..
...and I feel SO young...Hahahaha! OH Hanna ..... m favourite Aunt Shana first daughter! hahaha .... I recalled chitchatting with 'MT' on Hilman's bday when Hanna passed by and I could not help but comment, hey y'all... tengoklah Hanna... tinggi melampai! Boleh jadi model! Alamak...what a contrast to my abang idin yg tak besar-besar tu. But study style wise, cam tu jugaklah. Very plaful. In fact - I have not seen him holding a book to study pun? Aisey... reminds me of his Ibu yg x rajin study tuh. Ohhh! habih lah anak aku! Errr...model? Olay? Silky Girl? Clean & Clear? Pantene? (NOT?!) Hehehe! Mothers will always be mothers - anak-anak dah beranak-pinak pun we still worry about them, I guess. It's a long and winding road ahead, my dear. Ini anak-anak kita baru primary school...Belum lagi masuk secondary, college, uni, etc., and belum lagi masuk bab-bab berboyfriend, bergirlfriend! Mm...weve decided that none of our kids will go to boarding school....Well that might change....we don't know? I guess yr entry would be very similar to mine at the same time last yr. That was when my eldest Mia took her UPSR. Yup, tension gile bila anak 1st ambik 1st real exam. But i heard that the 2nd time round wont be as difficult, for us moms i mean... hehe. I can still remember checking the Maths paper with a calculator with my hands trembling throughout.... OMG, the pressure was humongous! I think it's more difficult if our first one is a daughter, I guess? Somehow as mothers, we feel a strong(er) bond to them, than if they're boys kot? I spent some time trying to find your entry on your similar predicaments last year, but somehow I couldn't find it. Will keep on trying. But from your entries I've read so far, I think Mia is doing very well. Good on her!